The focus of the exhibit was peace and non-violent protest, as it was an extension of a traveling show that was commemorating the end if the Korean war. I had this idea in my head for a while to do something with the text “I am not your enemy. You are not my enemy.” So, when I heard about this show, naturally, my thoughts returned to this phrase. The concept is simple really… rooted in some sort of self affirmation turned outward. But one of the reasons I was drawn to it was because it was so simple. Why couldn’t the piece simply be about these words alone? I thought about painting it, then lettering it in ink, then lettering it in tea, as I had recently worked with tea… but then it dawned on me to letter it in blood. My blood. The simple act of collecting my own blood for the piece gave it a whole new life. Initially, I was going to have a friend of mine, who is a nurse, draw the blood for me. However, as the exhibit quickly approached, she didn’t have the free time, so I began to reconsider drawing it on my own. 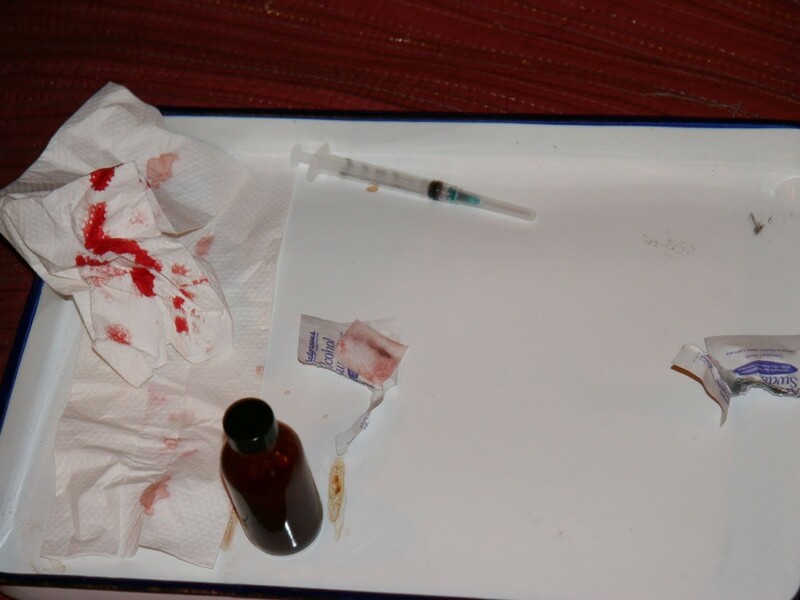 One of the big hangups was that I had a hard time acquiring the syringes necessary to draw blood. I thought that there would be some sort of legal lockdown on them, but in the end, I just walked into Walgreens and straight up asked them for needles… “you know… for hobbies… intricate gluing…” My uncle actually turned me onto this. The only catch was that I was asking for the super high gauge needles… the really thick ones. The kind they don’t normally use for veins. Which is probably why they didn’t assume I was up to no good. In the end, I got my needles for something like 75 cents each. Then, at a separate counter, I purchased a box of alcohol swabs, a bottle of saline, and a chocolate bar. For those of you who have known a junky, these are the exact things that they might be buying at a drug store… you know… other than drugs. As it turned out, it took about 6 or 7 tries before I was able to get enough blood to work with. First, I had to get over the size of the needles. Then I had to get over the size of the needles. All in all, it wasn’t as hard as I thought it was going to be. But neither was it even close to being easy. Three good pulls on the syringe at about 3 ml a piece gave me approximately 10 ml of my own blood. To which I added the saline to keep it from clotting. It was exceptionally hard pulling the stopper out with one hand… a couple of times I believe I punched right through the other side of the vein before I could get a full draw. By the end of the ordeal, I was black and blue in several places, and extremely nervous that I would run out in the middle of the lettering and have to draw more. On top of that, I was even more nervous that I had somehow let loose a blood clot in my system that would end up causing me major distress. It was probably the latent hypochondriac in me, but the next day my left leg started to have small throbbing pains in it, which really got me worried. So I took a couple of shots of whiskey to thin my blood just in case. Now it was the morning I had to deliver the piece, and I still had to frame the work. So I woke up early, and on a few hours of sleep set about making the frame and mounting the piece. Long story short, I made it to the drop off right at the cutoff time… looking disheveled like I’d been up all night, with alcohol on my breath, and lots of fresh track marks on my left arm. The extreme bruising didn’t help either. All I can say is I’m glad I didn’t get pulled over as I raced on the freeway to get there on time.